We’d love your help. 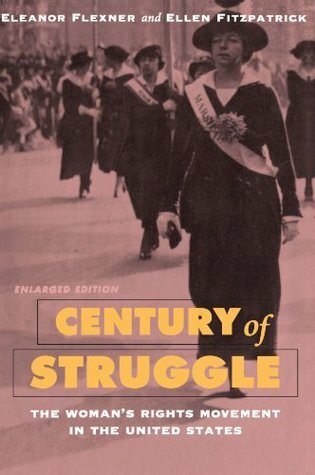 Let us know what’s wrong with this preview of Century of Struggle by Eleanor Flexner. Century of Struggle tells the story of one of the great social movements in American history. The struggle for women's voting rights was one of the longest, most successful, and in some respects most radical challenges ever posed to the American system of electoral politics. "The book you are about to read tells the story of one of the great social movements in American his Century of Struggle tells the story of one of the great social movements in American history. The struggle for women's voting rights was one of the longest, most successful, and in some respects most radical challenges ever posed to the American system of electoral politics. To ask other readers questions about Century of Struggle, please sign up. Oh my gosh, so much I didn’t know! Why is the suffrage movement not taught in U.S. History classes?! I picked this out to read because my new idea for a novel takes place in the later years of the suffrage movement, and I knew I needed to research the time period. While I was familiar with the Seneca Falls convention (notably, several people I’ve talked to about this book had never heard of it! ), I was completely ignorant about the vast majority of suffrage history. So many awesome women, and so Oh my gosh, so much I didn’t know! Why is the suffrage movement not taught in U.S. History classes?! I picked this out to read because my new idea for a novel takes place in the later years of the suffrage movement, and I knew I needed to research the time period. While I was familiar with the Seneca Falls convention (notably, several people I’ve talked to about this book had never heard of it! ), I was completely ignorant about the vast majority of suffrage history. So many awesome women, and so many horrifyingly misogynistic trials to overcome. Flexner does an awesome job at research. If you’re worried about inclusivity, Flexner does address black women’s contribution to women’s suffrage, and also the racism that occurred within the movement. This is a must-read for anyone interested in learning more about the women’s suffrage movement in the United States. Century of Struggle chronicles the woman's suffrage movement in the US from pre-Seneca Falls to when women finally won the vote, more than 70 years after the first woman's suffrage convention at Seneca Falls. Just to illustrate why books like this need to be read, I mentioned Seneca Falls to three or four people I know who asked what I was reading, and they had no idea why Seneca Falls was significant. They'd never heard of it. And it's no surprise. I've spent twenty years in the education syste Century of Struggle chronicles the woman's suffrage movement in the US from pre-Seneca Falls to when women finally won the vote, more than 70 years after the first woman's suffrage convention at Seneca Falls. Just to illustrate why books like this need to be read, I mentioned Seneca Falls to three or four people I know who asked what I was reading, and they had no idea why Seneca Falls was significant. They'd never heard of it. And it's no surprise. I've spent twenty years in the education system and minored in history, but I don't recall the woman's suffrage movement being discussed in a single class. 1. Political - political machines and many politicians (who were all male)worried that if women got to vote, they'd form their own "women parties" and only vote for women candidates. Even when individual states gave women the right to vote (Wyoming was first) and this did not happen, it didn't allay their fears. 2. Economic - powerful, well financed business interests wanted to maintain the status quo. Many changes were taking place in the late 19th and early 20th century that upset business interests and women voting rights was among those. The liquor/brewing industry, oil, banking and other big money industries surreptitiously financed anti-suffrage groups and lobbied legislatures around the country. 3. Racial - Southern states were solidly against women's suffrage because they were against all African-Americans voting. The southern states were fearful that if women (including black women) got the right to vote, they might eventually be forced by the federal government to open voting to all citizens, not just whites. Southern poll taxes and other schemes effectively disenfranchised blacks until the Civil Rights movement of the 1960's and the passage of the Voting Rights Act. Ten states never ratified the 19th Amendment -- all but Delaware were southern states of the old Confederacy. I loved learning more about the women's movement to gain the vote in this book. It was clearly excellently researched and full of fascinating information. I feel like I learned about more than history--politics, sociology, and media studies could easily be included in the topics touched on here. Eleanor Flexner provides a wonderful commentary about the figures and acts that made equality much more real to women. As a woman I'm always humbled by the courage and hard work that went into making this a society in which I can feel free to want my freedom. This book brings home that lesson. Very good overview, with enough personal notes to draw the reader in. Especially admired the determination of the author to include the racial aspect of the WRM and it's interplay with abolition. For the most part unflinching and comparatively objective. Aware of some glossing over, mostly of personally alienating factors but certainly to a lesser degree than most history books. Thoroughly enjoyed it, would reread. I originally checked this book out from the library. After reading the 1st few chapters, I knew I needed to have a copy of my own. It took me a while to get through, but this is a book every woman--and the men who love them--should read.... And I'll tell you something else. The next time I enter the voting booth, I'll have a new sense of pride & honor as well. I learned so much about the suffrage movement I didn’t know. This book is now outdated by several decades, but I appreciated the perspective of someone closer to the movement about where we have been and where we needed to go. I had to read this for my U.S. Women's Activism class. It is quite informative and interesting. There are things I can now tell people about our struggle to vote that I didn't know before. A bit dry at times, but there are worse books out there. It helped to have discussion questions for every chapter. I took a class in 1974 and this was one of the texts. I pulled it from the shelf when my son was doing a paper in a gender studies class at Duke. I found a new look at this time in my life very enlightening. This is the most comprehensive overview of the women's movement I've read. It is filled with information, yet still interesting to read. If I need to look up a fact on women's history, I often start with Flexner. Awesome book! I've always wanted to learn about women's heritage in this country. It was extremely informative. I suggest it to everyone! There were so many things that I had no idea happened to women throughout history, and their fight for change, which has given me so many freedoms. This was the classic text of first wave feminism for almost 30 years (it was originally published in 1959). She begins before Seneca Falls (although she argues that the movement begins here) and goes through the passage of suffrage. This book has alot of great info about womens history. At times it was hard keeping up with dates because they jump around alot from chapter to chapter, but overall a great book to read. Excellent book, made more interesting by Flexner's anticipating of most of the major themes of women's history. Eleanor Flexner was a distinguished independent scholar and pioneer in the field of women's studies.